Epirus Biopharmaceuticals, Inc., announced an agreement for the acquisition of Bioceros Holding B.V., enabling Epirus to expand its biosimilar pipeline and vertically integrate product development capabilities. From the Bioceros platform, Epirus will expand its pipeline with the addition of three preclinical product candidates: BOW080, a proposed biosimilar to eculizumab (reference biologic Soliris); BOW090, a proposed biosimilar to ustekinumab (reference biologic Stelara); and BOW100, a proposed biosimilar to golimumab (reference biologic Simponi). Soliris, marketed by Alexion Pharmaceuticals, is currently indicated to treat ultra-rare blood disorders, including paroxysmal nocturnal hemoglobinuria (PNH) and atypical hemolytic uremic syndrome (aHUS). Simponi and Stelara are marketed by Janssen Pharmaceuticals and indicated in inflammatory and immune mediated disorders. These three new pipeline assets represent a global growth opportunity for Epirus in targeting reference biologics with estimated 2020 peak sales of $12 billion. The platform also enables future pipeline growth opportunities for Epirus. The anticipated filing dates for the three new pipeline products are 2020 for BOW080, 2021 for BOW090 and 2022 for BOW100. Intas Pharmaceuticals has launched Razumab™, its biosimilar to Lucentis® (Ranibizumab). Intas is the first company globally to develop and launch a biosimilar version of Ranibizumab. Razumab is manufactured under strict guidelines for sterile use in the eye and is offered as single dose vial, thus reducing the risk of contamination during use. Ranibizumab is a therapeutic antibody fragment designed specifically for treating degenerative conditions of the eye. Ranibizumab is indicated for the treatment of Neovascular (Wet) Age-related Macular Degeneration (AMD), a common degenerative condition of the eyes in the elderly. It is also indicated for Macular Edema following Retinal Vein Occlusion (RVO), Diabetic Macular Edema (DME), Diabetic Retinopathy in patients with Diabetic Macular Edema and vision loss resulting from choroidal neovascularization in pathologic myopia (mCNV). “Intas’ Ranibizumab, Razumab™ is a 100% ‘Made In India‘ molecule, a feat achieved by the scientists at Intas and unparalleled till date. With the mission to provide global healthcare at affordable costs, Razumab will be about 25% cheaper than the imported Lucentis in the hand of the patient. Our objective is to make the treatment available to a wider patient pool, that is as yet denied treatment due to the high cost of imported Lucentis,” said Mr.Binish Chudgar, the Vice Chairman of the Company. Razumab is the tenth biosimilar launched by Intas in India, by far the largest number of indigenously developed biosimilars by any company. Since 2004, when Intas launched its first biosimilar, Intas has constantly worked to bring the latest in biological therapies to Indian patients at affordable prices. With its robust pipeline of future products under development, Intas aims to continue on this endeavor. Sandoz, a Novartis company, announced that the US Food and Drug Administration (FDA) approved Zarxio (filgrastim-sndz) for all indications included in the reference product’s label. Sandoz is the first company to receive approval of a biosimilar in the US through the new FDA biosimilars pathway established under the Biologics Price Competition and Innovation Act. The approval was based on a comprehensive package of analytical, nonclinical, and clinical data, which confirmed that Zarxio is highly similar to the US-licensed reference product. The approval of Zarxio follows the unanimous positive vote in January by the Oncologic Drugs Advisory Committee (ODAC). Marketed as Zarzio® outside of the US, the Sandoz biosimilar filgrastim is available in more than 60 countries worldwide, has generated over 7.5 million patient-days of exposure and is the most widely used filgrastim in Europe. Samsung Bioepis Co., Ltd., announced that the Marketing Authorization Application (MAA) for its Enbrel (etanercept) biosimilar candidate, SB4 has been validated and accepted for review by European Medicines Agency (EMA). The acceptance of the MAA marks the first Enbrel biosimilar to advance into regulatory review in the European Union (EU). The MAA is based on results from a Phase III clinical trial in patients with moderate-to-severe rheumatoid arthritis (RA). In Europe, Enbrel is indicated for the treatment of a number of rheumatic diseases, including moderate to severe RA, certain forms of juvenile idiopathic arthritis, psoriatic arthritis, ankylosing spondylitis and plaque psoriasis. If authorized by the EMA, SB4 could be available for use in all of the same indications as Enbrel. “This MAA validation represents a significant milestone for Samsung Bioepis in our work to develop and manufacture world-class biosimilars. More significantly, it offers an opportunity to provide high-quality and effective therapies for broadening access to patients in Europe” said Christopher Hansung Ko, chief executive officer of Samsung Bioepis. If authorized by the EMA, SB4 will be commercialized in Europe by Biogen Idec. It will also be produced at the company’s manufacturing facility in Hillerød, Denmark which is one of the largest biologic manufacturing facilities in the world. In addition to the European filings, Samsung Bioepis intends to move forward with additional applications for regulatory approvals in other territories worldwide. Ranbaxy launches first Biosimilar Infliximab in India! Ranbaxy Laboratories Limited (Ranbaxy), one of India’s largest pharmaceutical company, announced on 1.12.2014 the launch of Infimab (BOW015), the first Remicade (infliximab) biosimilar in India. Infimab, is being introduced in the Indian market through a licensing partnership with Epirus Biopharmaceuticals, Inc. a US and Swiss-based biopharmaceutical company focused on the global development and commercialization of biosimilar monoclonal antibodies. Infimab will be manufactured by Reliance Life Sciences at a facility in Mumbai. The innovator reference product is currently marketed for the treatment of inflammatory diseases including rheumatoid arthritis, Crohn’s Disease, ankylosing spondylitis, ulcerative colitis, psoriatic arthritis and psoriasis. Infimab marks Ranbaxy’s entry into mAb (Monoclonal Antibodies) biologics, and will help the company provide greater access to quality biologic medicines in management of conditions like rheumatoid arthritis. EPIRUS Biopharmaceuticals, Inc. announced that it has received final marketing and manufacturing approvals for its Remicade (infliximab) biosimilar, BOW015, from the Drug Controller General of India (DCGI). BOW015 is the first infliximab biosimilar approved in India. BOW015 is a biosimilar to Remicade, which is marketed globally for the treatment of inflammatory diseases including rheumatoid arthritis, Crohn’s Disease, ankylosing spondylitis, ulcerative colitis, psoriatic arthritis and psoriasis. BOW015 will be manufactured by Reliance Life Sciences at a facility in Mumbai which was inspected and approved in July of this year. The DCGI has issued the final clearances for BOW015, and EPIRUS and its commercialization partner Ranbaxy Laboratories Limited (Ranbaxy) expect to launch the drug, under the brand name Infimab®, by the first quarter of 2015. Ranbaxy and EPIRUS signed a licensing agreement for BOW015 in January of 2014. Under the terms of the agreement, EPIRUS will develop and supply BOW015, and Ranbaxy will register and commercialize BOW015 in India as well as in other territories in Southeast Asia, North Africa, and selected other markets. Sandoz, a Novartis Group company, has announced that FDA has accepted its Biologics Licence Application for filgrastim, which was filed under the new biosimilar pathway created in the Biologics Price Competition and Innovation Act of 2009 (BPCIA). The reference product — Amgen’s Neupogen — is indicated to decrease the incidence of infection, as manifested by febrile neutropenia, in patients with nonmyeloid malignancies receiving myelosuppressive anticancer drugs associated with a significant incidence of severe neutropenia with fever. 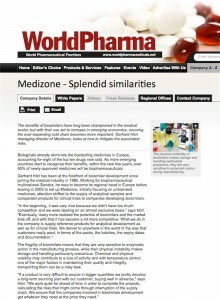 Under the brand name Zarzio, the Sandoz biosimilar filgrastim has been marketed in more than 40 countries outside the US, generating nearly six million patient-exposure days of experience. Zarzio is the number one biosimilar filgrastim globally and is the leading daily G-CSF in Europe with 30% volume market share. Falsified / stolen pharmaceutical products circulate in Germany! German authorities are investigating currently the incidence of falsified / stolen Biopharmaceutical products originating from Italy. According to a BKA spokesperson six products are under scrutiny – Avastin, Mabthera, Herceptin, Remicade, Alimta and Humatrope. End of April EMA already warned about falsified Herceptin circulating on the german market. Obviously the Herceptin was stolen from italian hospitals and were sold via a UK wholesaler to german PI companies. The concerned batches were recalled from the german market. Rumor has it that 2 truckloads were stolen from Roche in Italy during transportation last December. Why the concerned batches were not recalled instantly is not known yet. There is a high risk that due to improper transporation temperature the quality of these goods may have been negatively impacted before they may have reentered to supply chain. On May 29th the warehouse of the pharma-forwarder “trans-o-flex” in Neuss was burgled. The thieves took 53 pharmaceuticals of Eurim Pharm, Johnson & Johnson, McNeil, MSD SHARP & DOHME, Bayer Vital, Janssen Cilag, CC Pharma and others. The list of stolen articles becomes longer day by day. Actuals List per 12.6.2014 of stolen products and batches can be found here (German only) – click on the red text and a PDF should open – batches are listed page 3 ff. The German “Arzneimittelkommission” advises to check the incoming goods since May 29th of the affected batches and deeply check them for any hints of manipulation.